unless you’re investing in a transformation! Do you ever wake up with knots in your stomach wondering how did I get here? Do you sometimes feel trapped or stuck in your life? Is stress, overwhelm and burnout taking a toll on your work, relationships, health and spirit? This was me four years ago. I wrote this book because I found a way from burnout to bliss. In my research I discovered many authors explain the science of stress and burnout, but they weren’t giving me the life boat to pull myself out of when I was drowning. I needed help, answers, actions to force me from the depths of physical and mental burnout. With from Burnout to Bliss, I have given you a lifeboat and a very detailed map to take you on a transformative journey that can change the rest of your life and the lives of those around you. You can jump-start your life by implementing what I share. Everything I offer to you, I have experienced myself. My journey took four years… yours doesn’t have to! DOWNLOAD YOUR FREE "BLISS KIT"
The term that best describes Jessica Sitomer is “Passionpreneur.” She successfully runs multiple businesses, including a career in the entertainment industry spanning over 20 years. She works as an actress, host, writer,and has produced a sitcom pilot and two television series; Prescriptions, a show within a show for MTV, and Lights, Camera, Action, a reality show that is Top Chef meets The Apprentice for entertainment industry professionals. As an in-demand speaker, Jessica is the go-to gal for entertaining, inspirational, and informational talks. Her 1000+ international speaking engagements, keynotes, and trainings have helped audiences with business productivity, mindset success, and implementable strategies for achieving their dreams. She is the author of two other books, including, “And.. Action, Powerful, Proven, Proactive Strategies to Achieve Success in the Entertainment Industry. 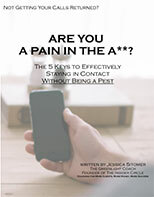 “Jessica focuses on living a balanced life of success, family, friends, health, and happiness. Click one of the links below to automatically share this page to your social network.